Long before the "Jim face" was North America's favourite reaction GIF, actor Martin Freeman made waves with his very own "Tim face" on the British version of The Office. Since then, he's turned his loveable curmudgeon persona into a major TV and movie career, with roles in The Hobbit, Sherlock and Fargo, to name a few. Up next, he's headed to the Marvel universe. 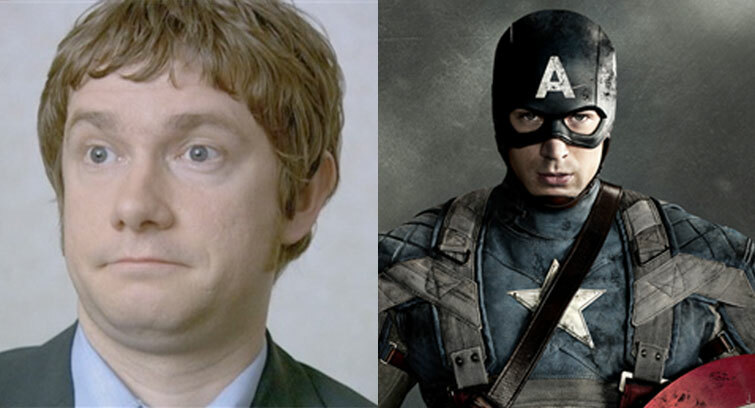 While his exact role is unclear, Freeman has confirmed as a cast member in the forthcoming Captain America: Civil War. The film is due in 2016 and will also star Scarlett Johansson, Elizabeth Olsen, Jeremy Renner and, in its titular role, Chris Evans. In a statement, Marvel chief Kevin Feige said, "From his roles as Bilbo Baggins and Doctor Watson to Tim in The Office, Martin's range from the dramatic to the comedic has consistently impressed us.... We couldn't be more honoured or excited to have such a talented actor join the Marvel Cinematic Universe." Captain America: Civil War will hit theatres on May 6, 2016.